YOU CAN SUBSCRIBE TO THIS BLOG! Read the biography of an organ , and with it, the biography of a city. The Estey pipe organ in Marion’s Memorial Coliseum was one for Estey’s storied “luminous” consoles. That in itself should make this book worth reading. But more than that, the organ was a symbol of all that was good, and much that was not, in this rust-belt community, as its citizens celebrated and then lost an economic boom, reinvented their town into an industrial city, lived through the madness of a lynching in 1930, created one of the world’s most celebrated passion plays, and endured Depression and war. It also looks at the pipe organs in the churches, theaters, and public buildings in Marion, including the 4-manual Page organ at the “unlucky” Royal Grand Theater. All that in the first half of the organ’s life, and all in the first half of the book! The organ was abandoned and silent for over a decade. 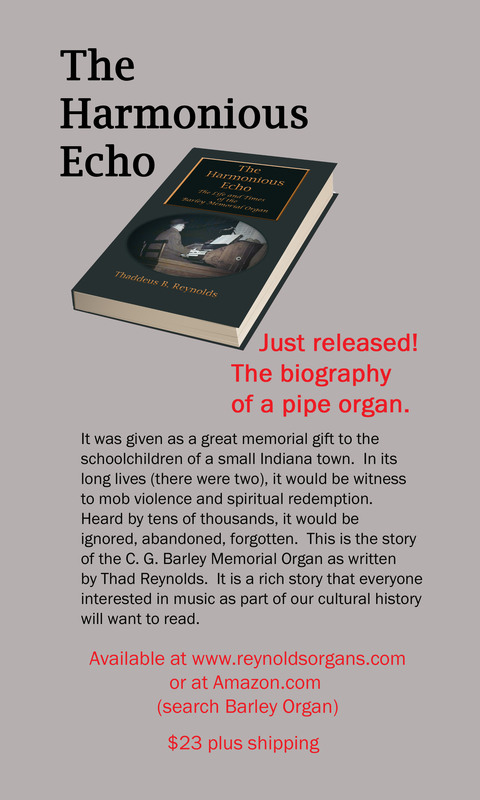 You can order “The Harmonious Echo” from amazon by clicking on the image to the left. The last time I posted to this blog was last spring, just before the spectacular rededication concert on the E.M. Skinner/Reynolds Associates organ at High Street United Methodist Church in Muncie, IN. Raul Prieto Ramirez, the world-renowned virtuoso who now TEACHES ORGAN AT BALL STATE UNIVERSITY gave us a wonderful program. After High Street, we finished the new Shelbyville organ. I had tried to blog this whole project, but the time constraints became too much. So, I will add postings to bring you up to date on the parts of the process I did not blog. I hate it when blogs and websites are not kept current, so I am engaging in a certain amount of self-loathing now when I look at my own sites. The concert in Shelbyville has not been scheduled yet, but I will let you know when it is. The organ is spectacular, and well worth the extra weeks and months we lavished on it! Presently, we have two projects moving in tandem. First United Methodist in Connersville, IN is getting a complete makeover of its 1940 Moller organ, which was par-boiled when a big steam pipe in the basement (right under the pipe chambers) vented for several hours. We are building new chests and adding to the organ. We have had to deal with a lot of hidden damage, especially in the wood pipes. We are also building a new 4-manual organ for First United Methodist Church in Plainfield, IN, which will begin installation right after the Holidays. 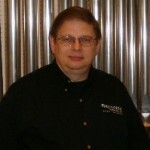 Both the Connersville and Plainfield organs are discussed on our website, but I will tell you more as they move along. Finally, years of going up and down ladders have finally ruined my knees. So, in the midst of everything else, my first knee replacement is scheduled for January 11. High Street Organ is Ready! Getting an organ ready for its inaugural concert is, I guess, like getting an Indy car ready for the race. You want everything to be just right! 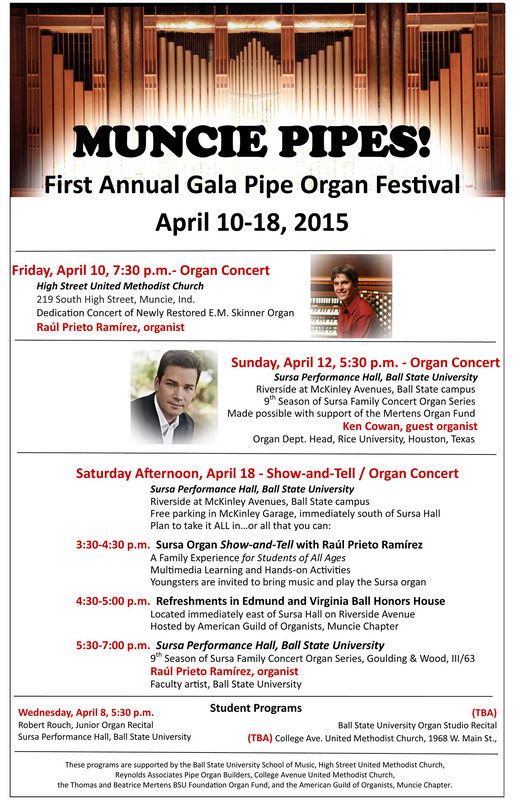 This Friday evening, April 10, Raul Prieto Ramirez will play the opening concert on the IV manual/70 rank E.M. Skinner/Reynolds Associates organ at High Street UMC, 219 South High Street, in downtown Muncie, IN. The program starts at 7:30 p.m. I listened today to Raul, an incomparable international virtuoso, preparing his program. WOW! This one is not-to-be-missed. Come with an empty spirit, and by the time you leave you will be filled! Here is a sample of the sound of the organ. This isn’t Raul – it’s Martin Ellis, who recorded this Fanfare in the organ’s performance recorder a couple of years back. I used it to test out my recording gear for the concert, and the result was so good, I had to share it! It’s in Dropbox. Click on the link below. You may have to download the file, but you can delete it when you’re through if you don’t want to save it on your computer. But I’ll bet you will want to save it! 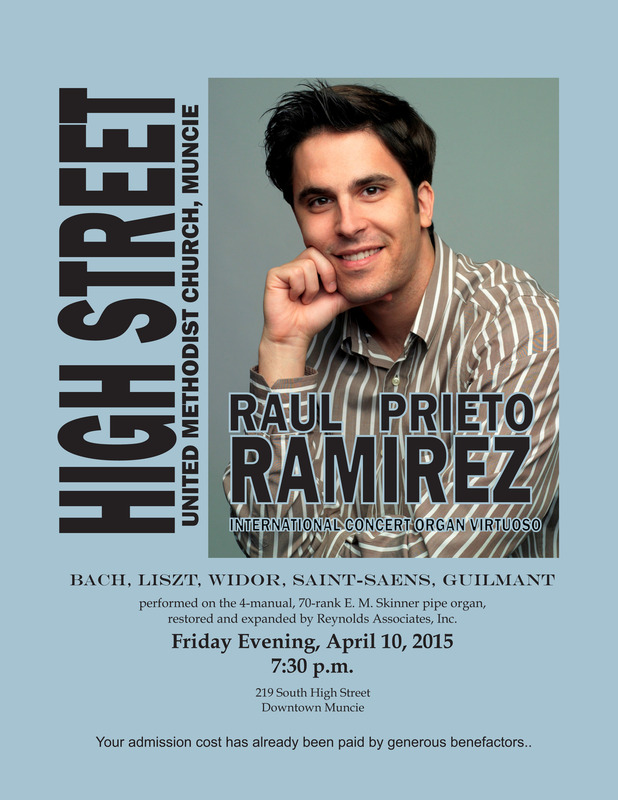 Join us at 7:30 p.m. on Friday, April 10, to hear international organ virtuoso Raúl Prieto Ramírez in the inaugural concert for the E. M. Skinner/Reynolds Associates pipe organ at High Street United Methodist Church in downtown Muncie, IN. Our project which took place in two phases over 6 years, included renovation of the 4 manual console, mechanical renovation and restoration, and expansion of the organ’s tonal resources. This great organ, one of the few truly Romantic pipe organs in Indiana, and one of the largest, now contains 70 ranks of pipes. The project was crowned by the addition of a new horizontal Trompette en Chamade, with spun bells of solid copper, and mounted on either side of the stained-glass window at the rear of the sanctuary. Mr. Prieto Ramírez will open his program with Bach’s Toccata and Fugue in d minor, one of the most beloved of all the great organ works, and it just gets better and better from there. Because of a generous donation, your admission cost for this concert has already been paid for. All you have to do is to come and be filled with the music. The Shelbyville Organ: New Toes for the Basses! Organ pipes are durable. In fact, well-made organ pipes, properly cared-for, can last nearly forever. They become a portal to the past, as we hear sounds that were crafted decades or even centuries ago. Part of a major organ project, such as the one at St. Joseph’s Catholic Church in Shelbyville, is repairing and maintaining the older pipes, and blending the sounds of old and new together to form a new musical being. I have always thought that one of the most excruciating art forms is the ballet. Its beauty comes not only from practice and technique, but also from sheer endurance. Consider for a moment the ballerina that is en pointe. That is, she is elevated on the very ends of her toes. Yikes! All her weight, and all the force of her dance is concentrated on one or two square inches of contact with the floor. This image, borrowed from dance, demonstrates the reason for one of the most common repairs we make to large organ pipes. Now, imagine our “pipe” ballerina again. She stands en pointe for over one hundred years! Often, after such a long time, the toes of some of the large pipes (typically those over 4′ in length), are deformed by the weight they support. The metal in these toes, which is usually lead, forms itself to the shape of the hole in which it is resting, sometimes actually closing the hole and choking the air supply to the pipe. When we move these big pipes to new windchests, as we are doing in Shelbyville, these toes must be reformed. With larger pipes, we usually simply remove the old cast toe points, and solder new toes onto the pipe feet. I’ll bet a lot of ballerinas wish their toes could be fixed as easily! Here’s a video of one of the big pipes from St. Joseph’s having this process of pipe-podiatry! This process has been done to about 60 pipes in this organ. Blogger’s note: I hope you all had a joyous, merry, MUSICAL Christmas! It has been very hectic for us, tuning dozens of organs in a very short time, which is the reason I haven’t contributed any postings lately. During “tuning season,” we must focus all out attention on getting our customers ready for Christmas. As I have said before, each pipe in a pipe organ is an individual instrument, requiring individual construction and individual attention to give it an individual voice. It is the combination of all these individual voices that make the pipe organ special, and that separate it from the instruments that seek to duplicate its sound. We now have our new pipe metal, uniform, cured, at peace with itself. We have the raw materials for the pipes. Using templates, the parts for the pipes are cut from the flat metal. After each of these pieces is cut out for each individual pipe, the craftsman’s magic really begins – tuning metal from the earth into an instrument for the angels. (Okay, maybe I’m laying it on a little thickly, but it’s really how I feel about it!) The work requires patience, a steady hand, and practiced skills. Before the pieces are assembled, sizing is painted on in places where the pipemaker does not want solder to adhere. This sizing, which will later be washed off, is made in the shop from a recipe that is centuries-old. In his shop, the pipemaker has sets of “mandrils,” simple wooden forms usually made out of rock maple. Placing the metal on the mandril, he rounds the pipe to the shape of the mandril, and smooths it using a specially-shaped paddle called a “beater.” The word is something of a misnomer, since beating the metal would deform it. The process is really more one of smoothing the metal. The pipemaker forms the pipe column on a mandril. Once formed, the seams of the pipes are soldered (flawlessly). Now the pipes are ready to solder. The edges that are to be joined are scraped down to fresh, clean metal, and rubbed with a candle made of stearine. The stearine will act as flux, to help the solder flow evenly and adhere to the metal. The pipemaker makes provision for the upper and lower parts of the mouth in the column and foot pieces. 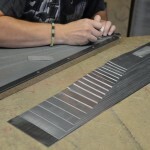 This may involve cutting out a piece of metal to receive a separate flat piece for each lip, or scoring the underside of the metal to allow the lips to be pressed flat once the pipe is assembled. Then, the languid, which transects the pipe, is assembled and soldered to the foot cone. The languid is perhaps the most critical component. An error of a few thousandths of an inch will ruin the pipe. Finally, the assembled column is soldered to the foot. If there is to be a cast toe point, usually on larger pipes, it is soldered to the bottom of the foot. Likewise, ears are added to pipes that are to have them. At this point, the pipe is too long, and it still can’t speak. We will do the final voicing in out shop (more about this later, too), but the pipes are prevoiced at the pipe shop. The upper lips of the new pipes are “cut up,” creating an upper lip at the correct height. This height is calculated from the width of the mouth. If the upper lip height is one-fourth the width of the mouth, the pipe is said to have a 1/4 cutup. In the pipeshop, these cuts are made conservatively, allow us to make the final adjustments. 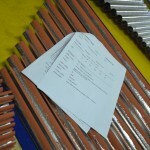 New pipes – built to our specifications specifically for this organ, are inspected, packed, and crated. Once the heights of the upper lips are established, the pipes are cut to length. Then they are adjusted and tested to be sure they speak properly. 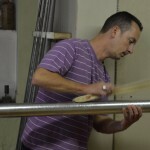 They are not yet voiced for the new organ, but when they leave the shop, the pipemakers know that each pipe is properly made and can be adjusted by the organbuilder to fit the needs of the instrument. Finally, each pipe is carefully wrapped, packed, and crated for shipment. These individuals – hundreds of them – are now ready for their long journey to our shop. There, they will meet pipes that were made a century ago, born of the same processes and the same techniques. Together, new pipes and old will form a new chorus of sounds for St. Joseph’s Church. I want to comment briefly about church communication in our post-modern world. EVERY CHURCH, whether very large or very small, should maintain a website, and should have an e-mail mailbox that is posted on that website and is monitored at least daily. Facebook and Twitter are great, but many people don’t know how to use them. Today, it is easy and cheap (even free) to build a great website. I also suggest that the denominational offices of the big churches (UMC, Disciples, Episcopal, Catholic, etc.) should give local churches assistance to be sure that the website structure is correct, and that all the information (contact info, service times, emergency contacts, etc.) is present. Every business (and a church is a business) should let customers and potential customers know what it is selling. The church is selling something beyond price. Not having a website or blog, or not keeping it current, sends the message that that business is either out of business or in hibernation. Here’s an idea! Find a volunteer to do this. Maybe your church youth group will take on the maintenance of the website (with pastoral supervision, of course). I post this here because I am constantly amazed at how difficult it can be to make e-contact with many churches. The Internet is a magnificent tool for reaching out to others. Which is to say, it’s a tool for outreach. All it takes is an inexpensive digital camera and a tiny bit of expertise to let your church be visible to the digital world. Every church we encounter in our travels has something wonderful to offer. Note: There comes a time in almost every organ project when the customer is wondering when they will see their organ again. Rebuilding an organ such as St. Joseph’s 1912 M.P. Moller organ is labor intensive and time-consuming. Besides all the big construction, each individual pipe from the old organ has to be assessed, cleaned, repaired and voiced for the new organ. We’ve been at it for months, and shortly after the Holidays, you will see the organ start returning to the church. One of these parts is the organ console. 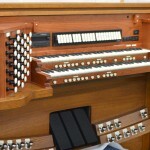 The console for a pipe organ is comparable to the keyboard on your computer. Just as your keyboard doesn’t do any actual computing, the organ console doesn’t really create any music. The console is the control center that allows the organist to control the organ (the pipes). 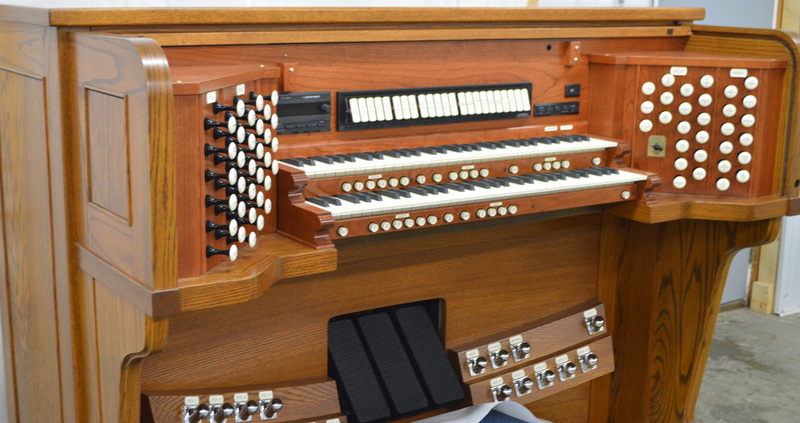 Still, the console is absolutely critical (you might say, “key”) to the success of an organ. Cory strips the old finish from the console's oak frame (last summer). probably between $35,000 and $50,000, even though console restoration is time-consuming. This console was itself a replacement for the organ’s original keydesks, and was installed when the organ was electrified. Now, as the console nears completion, I want to share a few photos with you, and some specifics. The oak console cabinet was completely dismantled in our shop, down to the smallest possible pieces. Everything was stripped, sanded, stained, and refinished. The new interior is made of cherry. The keyboards are also new. The keys are made of a special wood laminate that resists warping. In the past, even on very costly consoles, keys could warp slightly seasonally, disturbing the contact points and even causing keys to stick and bind. The coverings are made of a special synthetic material that is given a hand-rubbed satin finish to approximate ivory. The new keyboards on the bench. integrated control system, a computer network that will handle all the relay and memory functions of the new organ. There are new “toe studs,” to allow the organist to control memory functions with feet as well as hands, a new pedal board, and a new music desk and lighting. Those who helped move the old console out will probably do a double-take when they see it renewed! And they will see it in the next few weeks. I’ve left you hanging on the pipe-making process. That’s because we have had to get a lot of organs ready for Christmas! Rear view of the console, showing the new ICS control system (the black box is the main processor). Our very best wishes to you and yours for a joyful, peaceful, and blessed Christmas! Almost ready! New keyboards and stop jambs installed. Isn't the cherry wood beautiful?